Warmer winters have led to an increase in rat populations, which has led to city governments taking steps to address this problem. However, the methods they’re using have come under fire from the Environmental Protection Agency (EPA). New York, Chicago, Boston and other big cities have tried using dry ice to keep rat populations under control. While this method might help in some cases, it isn’t approved by the EPA. In fact, the agency announced that using dry ice for rodent control is against federal guidelines, since it hasn’t been registered with the EPA. The EPA helps ensure that methods of pest control used for rodents are safe and don’t put the public and the environment at risk. Using a method that hasn’t been approved by the EPA means that these cities could be risking the health of residents and the environment. Residents in NJ who are dealing with larger rat populations around their homes shouldn’t attempt to use dry ice. Instead, they should rely on dependable NJ pest control services to get rid of these pests. This helps keep people safe while also eliminating their rodent problem. If you have rats in your yard or home, please contact Allison Pest Control as soon as possible. 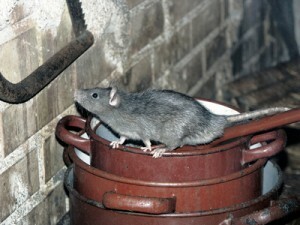 Our NJ pest control services can eliminate these rodents from your property safely and effectively. Is There a Pizza Rat In Your Neighborhood? The “Pizza Rat” rose to Internet fame after a video of a rat trying to carry a slice of pizza down subway steps in New York City surfaced. During the short video, the rat attempts to drag the entire slice to the bottom of the steps. While Pizza Rat has inspired tons of online comments and even Halloween costumes, the video shows the failed efforts of the city to handle its rat problem. The NYC budget includes $2.9 million for reducing the city’s rat infestations, but these stubborn pests haven’t been easy to eradicate. Despite the removal of garbage cans in areas with high rat populations to cut down on food sources for these pests, their numbers have continued to grow. Rats have been breeding and increasing their population, which is making it harder to effectively get rid of them. The city offers them several ideal places to live, including subway tunnels, empty properties and sewers. Since these critters can be a public health hazard by spreading disease, it’s important for the city to step up its efforts to control their populations or come with more effective ways of reducing their numbers. Otherwise, there could be several more Pizza Rat videos popping up. If you’re in need of Monmouth County rodent control services, we can help. Contact Allison Pest Control if you’re having problems with rats, mice, spiders, termites or other critters in your home. A recent online chat in Washington gave residents an opportunity to ask questions and receive advice about rodents. The district also offers a hotline where residents can call in to report problems with rats or sightings. Here are a few of the questions people shared and some of the advice given regarding rats and what to do about them. Should people be concerned about seeing rats in their home or yard? The answer was yes because rats carry germs, parasites and disease. Should seeing a rat or rats be dealt with immediately? The answer was yes because where you see one, most likely, there are many more. Will rats eat vegetables growing in my garden? Yes. Rats eat most anything available including overflowing garbage cans, acorns, berries, food wrappers thrown to the ground, even dog business. Are rats dangerous to the home? Yes. Rats chew wires which can lead to electrical fires. Things you can do include caulking holes used as entryways, using mesh wiring to cover openings, or stuffing small holes wit steel wool. Removing rodents can be an involved process and best done by professionals. While there are steps residents can take to help alleviate a problem, specific rodent elimination and control services are usually necessary. If you’re experiencing a rat problem or infestation, contact our experts at Allison Pest Control. With years of experience, we’ll handle any issue efficiently, safely and securely. Are UK Pesticide Resistant Super Rats Coming Our Way? You may have heard the stories of the “super rats” in England that are resistant to rodenticides. They have been found in public places like hospitals, and pest control companies seem to be at a loss as to what to do about them. The biggest issue here is that pesticide companies in England are continuing to use poisons that have been around since the 1950’s. The main reason for this is that these types of pesticides are inexpensive and readily available. However, the rats have virtually become immune to these older and potentially obsolete materials, so they are having little, if any, effect on the rat population. 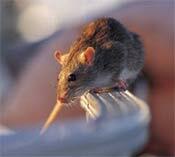 There are pesticides available that are extremely effective at controlling rats. The newest rodenticides are not blood thinners, which the “super rats” are immune to, the newest formulas are made to interfere with brain and liver function. There is no immunity to these types of modern rat pesticides, and any rat that comes from England, or anywhere else for that matter, would be just as susceptible to these newest preparations as any other rat would be. If you believe you have a rodent problem, or just want more information on rats, mice or the pesticides used to control them, please contact us at Allison Pest Control. Serving Monmouth and Ocean County for nearly 100 years. Rats from Norway? Actually not. Amplified over the years resulting from a mistaken 18th century theory, this Central Asian rat goes by a slew of aliases, including common rat, brown rat, street rat, sewer rat, Hanover rat, and wharf rat. How can you tell if these Norwegian nincompoops have hijacked your home? With a blunt nose, close-set bald ears, and a cylindrical brown body ending in a sparsely-furred flesh-tone tail, Norway rats are about 16 inches in height and range in weight from about ¾ to 1 lb – though portlier rodents can weigh-in at up to 2 lbs! Norway rats are excellent swimmers, but poor climbers, unlike their cousin the black rat. They are nocturnal and opportunistic omnivores, munching on anything they can get their disgusting little paws on, from plants to animals. Living in burrows, sewers, and cellars, their social hierarchy is bent on maintaining population when family members are lost. Because these rodents rapidly reproduce, fast, full eradication via effective rodent control is essential to elimination. A brown rat breeding bonanza can result in 12 litters of up to fourteen babies per year from a single rat! Multiply that times their 1-3 year lifespan and the number of rats in a colony, and that’s a lot of vermin! Don’t let rats chew a hole in your wallet. Contact Allison Pest Control today.